The Rodeo City Rollergirls had a couple of amazing bouts with Slaughter County Roller Vixens and Skagit Valley Roller Derby! We appreciate both teams making the trip over to play with us, we had a great time! Cat-a-ma-Ram and Sin Gria played their last bout with us at this event. We are going to miss them the way the flowers miss the sun! We tried to anchor them down, but alas it did not stop them. The final score for our first bout was Rodeo City’s Posse 175 to Slaughter County Roller Vixens 82. The final score for our second bout was Rodeo City’s Beauties 234 to SVRD 70. The Vixens voted Hula C Nation as the Posse’s MVP! SVRD voted Ricki Bobby as the Beauties’ MVP! We appreciate all the fans, sponsors, and volunteers who came out to support us! Thank you! The Rodeo City Rollergirls will be taking a break in August. Our next bout will be September 14th. We hope to see you there! 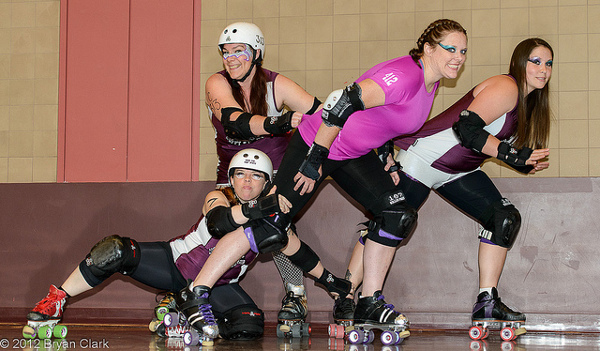 RCR photographer Bryan Clark captured some awesome derby action! Have a look on our photos page.